“The skills to do a job are different than the skills to get a job.” It’s unfortunate but true. While these six tips for getting hired in tech may not make the job search fun, they will hopefully prove helpful when applying to jobs in any industry, and especially those in tech. Based in San Francisco and representing many of the country’s top tech companies, sf.citi and our members are committed to making the fast-growing tech industry open to all. 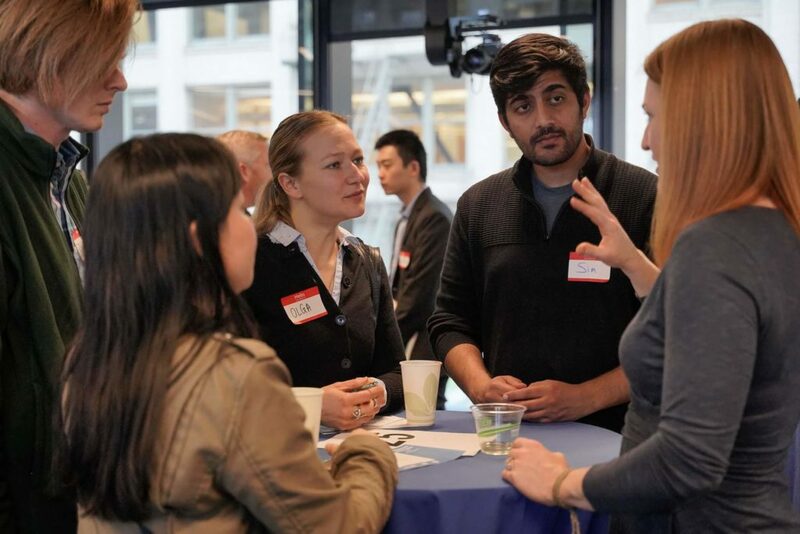 At the end of March, we partnered with LinkedIn, HireClub, and Jewish Vocational Service (JVS) to host Breaking Into Tech for the second year in a row. This evening of speed networking gave San Francisco job seekers the unique opportunity to hear from employees at AdRoll, Airbnb, Dropbox, Facebook, Okta, Optimizely, Postmates, Twitter, and many more, about what it takes to work in the tech industry. Read more about the networking advice attendees took away from the event. To continue the conversation on paving a career in tech, sf.citi consulted three experts well-versed on the job search and hiring in tech. They share common mistakes job seekers make and concrete ways to stand out in the hiring process, especially as a newcomer to tech. Pavle Stojkovic, Vice President of People at sports news startup, The Athletic, was quick to make this point. With over ten years of experience working in tech recruiting and human resources, he will tell you that “there’s no such thing as being a tech person.” He elaborated, “Tech is broad enough where all kinds of skill sets apply,” especially the soft skills. Ketan Anjaria, CEO of career coaching platform HireClub, encourages all of his clients to remove that long-engrained mindset of competing with everyone else for the same job. And he has evidence to back him up. Regularly updated data from the Bureau of Labor Statistics reveals that there are actually more jobs than people to fill them, especially in tech. Anjaria also understands what it’s like to enter the tech world with a nontraditional background. He has enjoyed a long and successful career in engineering and design all without a degree in either of those subjects. He speaks from personal experience when he warns against “othering,” or the notion in which you “separate yourself from the rest of the pack.” While not always a negative thing, “othering” often “makes you feel lower,” says Anjaria. Step 1: Tailor your resume (and LinkedIn) to the role. You need to present your past work experience in a way that aligns with the role for which you are applying. Keep in mind that recruiters spend very little time looking at each resume. “The more your resume aligns to the job description, the better,” says LeBold. Anjaria also advises that you “show how great you are in numbers.” In other words, make sure you support your accomplishments with concrete, measurable results. Step 2: Do a mock interview. Ketan Anjaria calls interviews the “hundred thousand dollar meeting.” It’s your one chance to potentially secure a high-earning income for years to come. The problem is that few of us know how we actually sound when interviewing. One strategy is to record yourself answering questions. Even better, says Anjaria, is third-party feedback, whether from a friend, colleague, or career coach. For more guidance on the interview process, join our friends at HireClub on April 24th for Interviewing 101. You’ll see a mock interview in action! In all his years as a career coach, Anjaria has observed that people avoid applying to jobs, even those they really want, for which they don’t feel qualified. While job postings are often written in a way that makes certain attributes (years of experience; degree; etc.) sound like strict requirements, that is not necessarily the case, says Anjaria. He recommends that you “find a way in.” After all, what do you have to lose? One of our experts said the job search is like “walking through a desert without a guide.” It can feel lonely, tireless, and never ending. A few things to remember are that everyone goes through the process, and there are concrete skills you can learn to increase your chances of getting hired in tech and many other industries. We hope these tips leave you feeling more confident and motivated to embark on your journey into the fabulous and innovative world of tech.